My tour plan was to camp where I could, but otherwise have no qualms about checking into a hotel. Finding a camp site is pretty easy in the areas well-frequented by tourists, such as the Loire valley, but more of an issue when in the middle of the working countryside. As I didn’t plan my daily itinerary, I just set off in the morning in the direction I wanted to go without knowing where I’d end up that day. Around 4pm-5pm each day I would have a look on Google maps for campsites. If there was no connectivity in the area I was in, I’d use my Garmin to find campsites that were in the correct general direction that I wanted to go. If there were no campsites within a reasonable detour of my route, I’d then use booking.com to find a hotel, preferably cheap or discounted. I’m very happy with my tent – it’s lightweight and packs down well. It’s plenty long enough for me (I’m 6′ 3″), and there is room to sit up in the middle to read. There’s plenty of extra room inside the inner tent to keep the things you want protected away from the damp, e.g. electronic equipment. There is enough space between inner and outer tent to store all my bags and even the bike itself, which came in handy once or twice when I didn’t find anywhere to lock the bike to. The porch area is also big enough to prepare a meal whilst you are sat in the tent, which also came in handy one day when it was pouring with rain. Have 6 inches of soil depth. It’s really annoying when there is just an inch of soil and then stone, which is quite common. Pretty much all my tent pegs are now bent as a result. Mow the grass so it is short. Otherwise it causes problems with condensation. Collect your grass clippings. Otherwise the grass gets everywhere. Do not put your camp site near a smelly animal farm. To avoid flies being a big nuisance. Provide toilet paper. Or at least sell it if you don’t provide it! Some camp grounds are huge operations. One I went to had two separate bar / restaurants including live entertainment. A lot of camp sites have maps to help you locate the area where people with tents are to pitch their tent. Campers with tents are in the great minority – most people at camp sites have caravans, motorhomes or similar. Most camp sites will ask you if you want bread in the morning. You can choose what kind of bread or patisserie you’d like from what their local bakery provides, and collect it in the morning. No milk though. The German campsites I visited in the North all had music playing in the toilet and shower blocks. This didn’t happen in the South or in France. Quite often the campsite showers were a bit muddy or grubby, and on these occasions I missed the clean comfort of a hotel. It’s nice to feel clean after you’ve had a shower, right? Some campsites provide free showers, others you have to pay for with a token, 50 cent or 1 Euro coin. The ones you pay for limit you to a certain duration of hot water, ranging from just over 2 minutes, to 4 minutes and 19 seconds at one German campsite which had an LED timer indicating the count down. 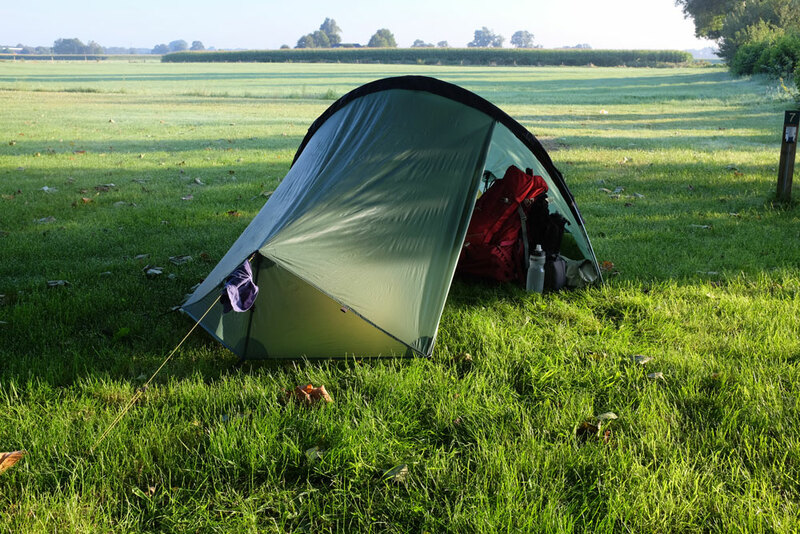 On clear nights, my outer tent would be soaking wet with condensation in the morning. On cloudy / warmer nights this didn’t happen so much. I found it didn’t matter too much if my tent was wet when I packed it up and it meant I could get on the road more quickly, which was important to me as I had a reasonable distance to cycle each day. All it meant was that when I unpacked the tent later that day (or the next day, or the day after), the inner tent would be damp. So I would wipe the inside floor of the tent with some tissue after pitching the tent, then wait 15 mins to give any residual damp a chance to air dry, before adding my sleeping mattress and sleeping bag. Campsites ranged from €7 to €14. A nice thing about staying in hotels was it allowed me to put the bike somewhere safe, which meant I could visit the town on foot. Another good thing is they invariably offer a breakfast. The hotels I stayed in were around €40 inc breakfast. One night in Germany I couldn’t find a campsite or cheap hotel where I was and ended up knocking on the door of a pension. It was really good value accommodation and more personable than a typical hotel. One night in France I used warmshowers.org to find free accommodation for the night, generously provided by other cyclists. This was brilliant. I tried to do the same on a few subsequent nights but had no luck in finding somewhere available at a day’s notice. I hope to reciprocate when I’m in a position to do so. Thank you so much, James Houston, for your blog! Really helpful information – I am lucky Samantha and Andy sent me the link to your website.